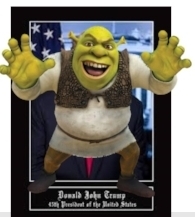 For those of you (Trump Haters and Never Trumpers) still angry and confused by the election of Donald Trump, perhaps you would be enlightened by the animated movie, “Shrek”. Shrek is an ogre who lives in a swamp. He is crude, smelly, rude and uses ear wax for candles. He likes his life just the way it is. Because the cowardly prince, Lord Farquaad, has confiscated his property—Shrek has to bargain to get his swamp back. The deal is that Shrek must rescue the Princess Fiona who is under the spell of an evil witch from a remote castle guarded by a fire breathing dragon. He dons a helmet and sets off with his donkey to rescue the princess. Shrek and Donkey locate the castle, cross a rickety bridge over burning lava, and find the princess. Fiona is anxiously waiting for a gallant hero, but Shrek is not gallant, shakes her roughly and simply says Lets go! Fiona who was expecting something more, protests-- I am awaiting a knight so bold as to rescue me. Should this not be a wonderful romantic moment? You should sweep me off my feet and take me down a rope to your valiant steed! You could recite an epic poem, or ballad…..
She continues to complain upon hearing the dragon roar: You didn’t slay the dragon? But this isn’t right! You were meant to charge in, sword drawn, banner flying. That’s what all the other knights did. After a harrowing escape from the dragon and crossing the lava, Fiona insists that Shrek remove his helmet so that may share “true love’s first kiss”. Reluctantly, he takes off the helmet. A shocked Fiona exclaims, You’re…an ogre! Shrek replies: Oh, you were expecting Prince Charming? Fiona: Well, yes, actually. This is all wrong. You are not supposed to be an ogre. And so, this the lesson of Donald J. Trump. Sometimes we don’t always get the leader that we expected or imagined. The hero who is brave enough, bold enough and persistent enough to save the day--or the country—may not meet the highest standards of probity, eloquence and political correctness. Or, you can refuse to be rescued by an ogre. You can return to your lofty tower prison and wonder why your country was lost to socialism, mob violence and poverty. You will compromise with the dragon and the evil witch as you “work together to get things done”. There you will sit, waiting, growing old and demented, softly humming: Someday my prince will come, someday I will find the one……. Post was jointly conceived and written with my wife, Martha.